Favorite Type of Sewing: Art quilting with the BERNINA 34D foot and the Dual Feed engaged! 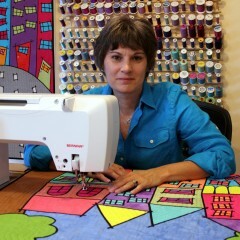 Sue is the author of “The Sketchbook Challenge” and in her latest book “Colorful Fabric Collage” she shows readers how they can create their own colorful, dynamic art quilts. She has written numerous articles for Quilting Arts Magazine, appeared on The Quilt Show with Alex Anderson and Ricky Tims, appeared in two episodes of Quilting Arts TV and recorded a Quilting Arts Workshop DVD titled Coloring Book Fabric Collage: dyeing, fusing, designing and quilting. Sue’s award winning quilts have been exhibited internationally and reside in private collections all over the world.